Point Line Flow: Map Your Moves. Move Your Maps. 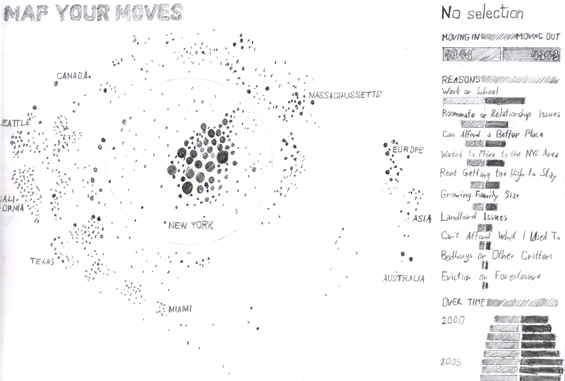 Map Your Moves by Moritz Stefaner is a visual representation of “more than 4000 moves from over 1700 people”, in and out of New York City. Moves here stand for relocations of residency, or we might say migrations. It follows these relocations over the course of 11 years, from 2000 to 2010. Stefaner used the data from an informal survey led by WNYC, a NYC based public radio station. Stefaner extracted from the data and represented several parameters or dimensions. First of all, location of the moves. The locations within the NYC have been sub-divided in zip codes, whereas the rest of the world has been mapped with a damped distance function. The NYC area is a white circle and it occupies the greatest part of the map, which is justified by the depth of detail, and by the simple fact that most moves naturally involved locations in NYC. The second dimension is the vector of the move: if we click on a particular location, the vectors appear and we can see all the moves to and from it, and, by pointing over the connecting migration lines, the person's reason for the move pops up. This information leads us straight into the lives of the moving people, and we can get a glimpse into their biographies, which is another subjective qualitative dimension. The chromatic dimension of the piece is telling, as Stefaner adopts only three hues, dark brown for the volume of moves, blue for the moves into the NYC area, and red for the moves out of the area. Another dimension is the quantity of the moves connected with a single location, be it a NYC zip code area or a city around the world, and it is shown by the diameter of the circle. Correspondingly, the location circles are coloured based on the sum of moves, as to say, if they received or sent outwards more moves. On the right side of the piece, beside the map, there are also two bar charts giving us the general statistical overview of moves, divided by reason and through time. So, at a single glance, all three dimensions are coexistant and clear. But, there is much more to this image than all these dimensions. Stefaner's treatment of the diverse information, and the information in itself, implies a major paradigm shift in our world-image, as it is provided by geographical science. This representation, together with some others with whom it shares certain characteristics, are reshaping our maps from bottom to the top. I do not have the name for this type of representation, there are some possible name options circling around the web, but it is not the point. Instead of naming them, I will try to see what they do.